I don't usually reblog science stories, but this week there's an article so interesting, and so close to my own research, that I'd feel silly if I didn't. And also I think the various websites which have re-printed the official press release have kind of missed the point of why this particular story is so interesting, so I'm going to try and redress that here. This is all about "dark galaxies", which are the very thing that led me into radio astronomy in the first place. This is going to be a pretty long post. If you're already familiar with dark matter, skip section 1. If you already know about dark galaxies and why they might be important, skip section 2 and go straight to section 3, where I describe the latest results. 1) Dark... what now ? Although not everyone likes the term, a "dark galaxy" is generally reckoned to be a cloud of gas sitting quietly inside a dark matter halo minding its own business. The point being that the gas isn't forming - or has ever formed - any stars, making it dark. Technically this means it's only dark to visible light - it can still emit at other wavelengths, like radio waves, so some people prefer to call them "optically dark galaxies" or "gas only galaxies". People who worry about such things probably don't get invited to parties very much, so I'm going to stick with plain-old dark galaxies for the rest of this post. Firstly, the dark matter. Over the years, "being mostly made of dark matter" has become the de facto definition of a galaxy. Dark matter is pretty simple really - galaxies are rotating too fast to be stable, so without something else beside the visible matter to hold them together, they should just fly apart. The links have more details if you like that sort of thing. This is what happens if you take the dark matter away. There are alternatives to dark matter (like different theories of gravity) and I'll admit to holding a small degree of skepticism about it even now. However, the evidence is leaning pretty far in favour of dark matter's existence (Ethan Siegel has this excellent summary), so I can't justify my skepticism rationally. For the rest of the post, let's go with the consensus and assume it does indeed exist. Sometimes, it can be tricky to tell the difference between a cluster of stars and a genuine galaxy (I stole this idea from Robert Minchin while he wasn't looking). What gives the game away is the dark matter - if the object needs dark matter to hold it together it's a galaxy, if it doesn't, it's a star cluster. Keep a copy of this identification chart handy if you have any doubts. Mind you, not everything without dark matter is a star cluster. With dark galaxies we're looking for clouds of hydrogen that need dark matter to hold them together, but haven't bothered to form any stars. If "dark galaxies" is a controversial term, then perhaps we could go with "lethargic galaxies" ? In some ways, they wouldn't be all that remarkable. In almost all cases, the hydrogen gas extends further from the center of galaxies than their stars do (usually by a factor ~2, but sometimes much further) - so in that sense, all galaxies have a dark component. But the idea of objects which don't have any stars at all is intensely controversial. 2) Are you sure you're talking about "dark matter" and not "doesn't matter" ? Pretty much everyone, I think, accepts the idea that some dark galaxies might exist. The sticking point is : are there just a few exotic, weird objects, or are there bajillions of the little blighters ? And that brings us to the "missing satellites" problem. This is nothing to do with China blasting satellites out of the sky - it's about how many smaller "satellite" galaxies should be buzzing around large galaxies like our own Milky Way. Theories suggest that there should be about ten times as many dwarf galaxies orbiting the Milky Way as we actually see. Huge projects like the Millennium Simulation (below) attempt to re-create the Universe inside computers. And they do very well on large scales, like filaments and voids, but fail miserably on the much smaller scales of individual galaxies. 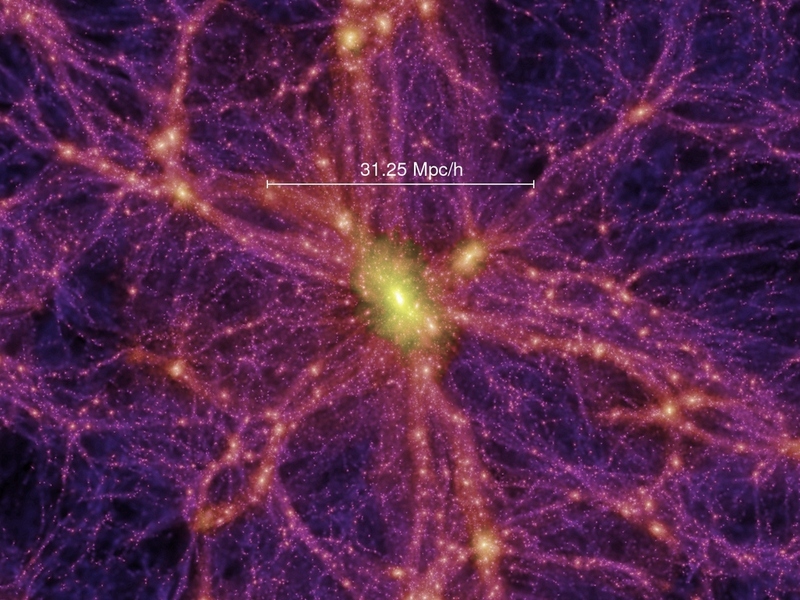 Dark matter (used as a proxy for galaxies) distribution in an artificial Universe. There are lots of possible explanations for this - finding galaxies can be quite hard, we may not understand the physics of galaxy formation all that well, or possibly there are just too many problems with our whole cosmological model and we should just give up and start again. That last one probably isn't as outlandish as some of us might like, but let's assume that we don't need to resort to such drastic measures. Even so, the missing satellite problem is a big problem in cosmology, and solving it would be a seriously major breakthrough*. * It's unclear whether the newer, spectacular Illustris simulation has any answers to this - we'll have to wait and see. Dark galaxies could offer a way out of this if most of those missing galaxies just haven't formed any stars. And, just like black holes, that would make them fiendishly difficult to spot. 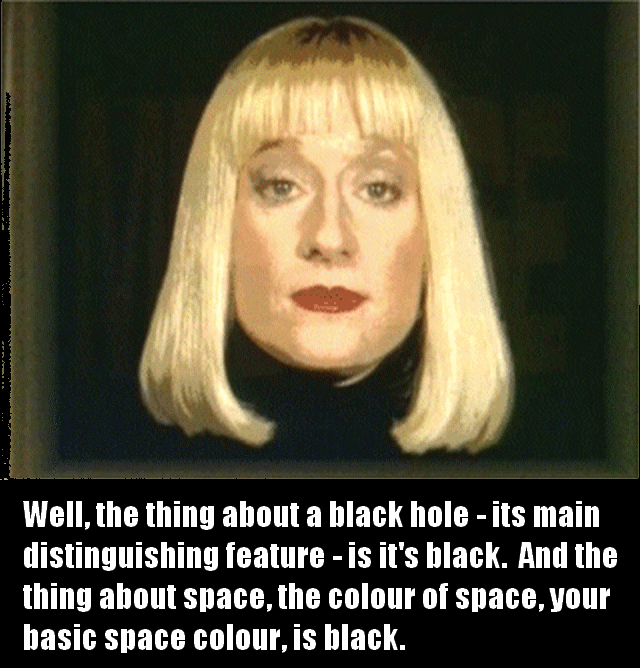 I'll let Red Dwarf's Holly explain why. Quite. But it's possible that some of those dark galaxies could have hydrogen in them - just enough to detect, but not so much that they'd start forming stars (more gas => more star formation... usually). Now, if there are only a very few such objects, then perhaps they don't really matter much in the grand scheme of things. But if we can prove that even one exists, then that allows the possibility that there could be many more, potentially solving the missing satellite problem. Proving the existence of even one dark galaxy turns out to be darn tricky. Which leads us on to the object that got me into radio astronomy in the first place : VIRGOHI21. It's not too much of a stretch to say that if this gif hadn't been shown at my PhD interview, I probably would have ended up doing something completely different*. I stole this one off Robert Minchin again. Poor Robert... allow me to compensate by saying, "go and read Robert's awesome blog !" * This is just one particularly famous example. During my PhD I discovered 8 other objects that might be sort-of similar to this one, but we don't have such good data for these yet. Various other candidates have been proposed over the years, but none have ever quite satisfied everyone. VIRGOHI21 is in the center, linked by a stream to the nearby galaxy NGC 4254 (the biggest, brightest blob). This is the hydrogen "data cube" for the region - for more on these, have a look here, here and here - well, throughout the whole blog, really. Robert has a detailed post about this object, so I'll just give a short summary. Basically, it's a cloud of hydrogen in the Virgo Cluster that's rotating too fast and seems to have interacted with a the spiral galaxy NGC 4254, with a long stream linking the two. It looks as though the hydrogen cloud be a dark galaxy that's pulled some of the gas out of NGC 4254... but the interaction is the problem. It's possible that the apparent rotating "dark galaxy" was formed when some other object pulled the gas out of NGC 4254, creating the illusion of a stable, rotating cloud of gas. And that's the crux of the matter. It's easy (ish) to prove that a gas cloud is rotating too fast and would require dark matter to be stable. It's far more difficult to prove that it actually is stable, and not just tearing itself apart. 3) Jeez Louise, get on with it and tell me about the new results already ! Which bring us on, at last, to the latest awesome press release, concerning an object called the Smith Cloud. This is an object which is interacting with our own Milky Way galaxy called a high velocity cloud - simply because it's gas that's moving more quickly than gas in the disc at a similar position on the sky. Lots of other HVCs are known, and there are almost as many theories as to what they are - maybe just gas thrown outside the galaxy by supernovae, though for the Smith Cloud this doesn't seem very likely... it's too massive. As the authors of the study say, it would take the power of 1,000 supernovae to eject it (you know you've got something cool when you cut out the bit about one thousand exploding stars from your press release). Or perhaps they're torn off by other interacting galaxies, or maybe they're primordial gas that's condensing from the intergalactic medium. Some of course, might be dark galaxies. In all likelihood, different clouds are probably formed in different ways. the Smith Cloud would cover almost as much sky as the constellation Orion." The idea that (some) HVCs could be dark galaxies is by no means new. The difficulty is proving it. 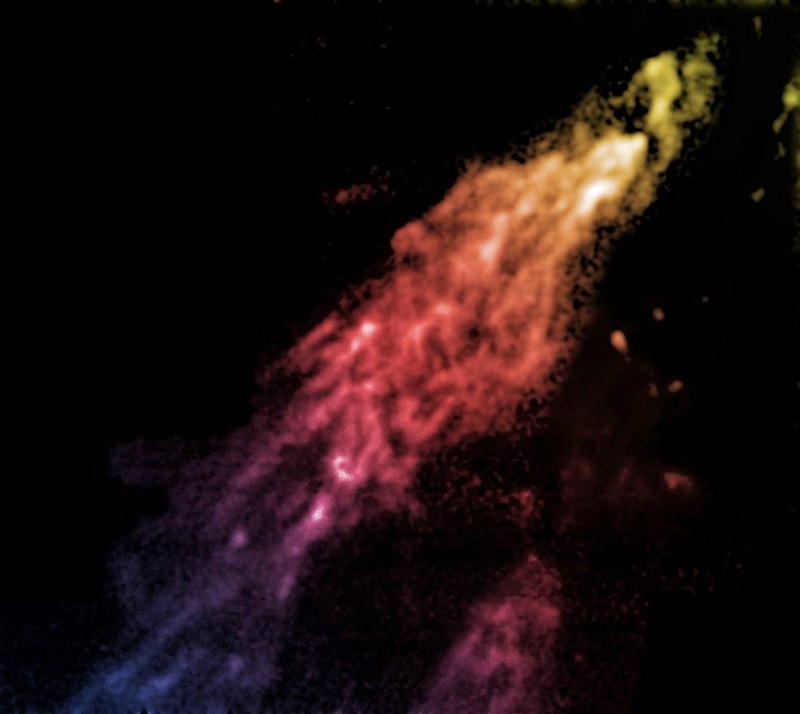 In the current paper, the authors describe the result of simulations of the Smith Cloud as it orbits our galaxy. From observations, they've been able to constrain its orbit (how well, I'm not sure) and find that it passed through the disc of our galaxy about 70 million years ago. They've gone to some lengths to test lots of different models, with and without dark matter, using different gas densities, to see what should happen to a cloud this massive as it punches through the Milky Way's own gas disc. Contours indicate the dark matter. Impressive stuff, especially since they have the comparison simulations without dark matter that just don't work. As far as I'm aware, the paper hasn't been accepted for publication yet, but it looks extremely interesting to me. 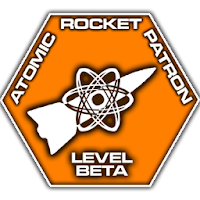 What would be really exciting about this is that it implies that at least some other HVCs could also be dark galaxies. That would really overturn a lot of current ideas and could, potentially, totally knock the missing satellite problem on the head. But let's be cautious, and remember VIRGOHI21. When this object was announced to the world, the controversy was intense, and the debate more than a little heated - in the end, few people still think it's a likely dark galaxy candidate. To me, it looked like a very plausible candidate initially, but as more observations were completed and more simulations run, it looked less and less plausible. I shall certainly be awaiting the final version of the Smith Cloud paper with baited breath (or in reality, with a nice cup of tea). The devil's in the details, of course... and it's always possible that this object is special, and not really representative of HVCs in general (it is, after all, a lot more massive than most of them). The authors themselves make no claims in their paper for anything as grandiose as solving the missing satellites problem - even if it is a dark galaxy, it doesn't mean there are more out there. Ultimately, though, if this object fits the bill, then it certainly makes dark galaxies look like a perfectly valid way to solve the problem. My biggest concern is a philosophical one : the authors have found a model that works, but that doesn't mean there isn't another model they haven't considered. Such things have been known to happen in the past. Also, I'm not an expert on simulations, so I can't tell if you what they've done is sensible or bonkers. Actually they don't give very many details about the simulation setup, or much description of exactly what happens during the simulation. Some of those details could be very important. 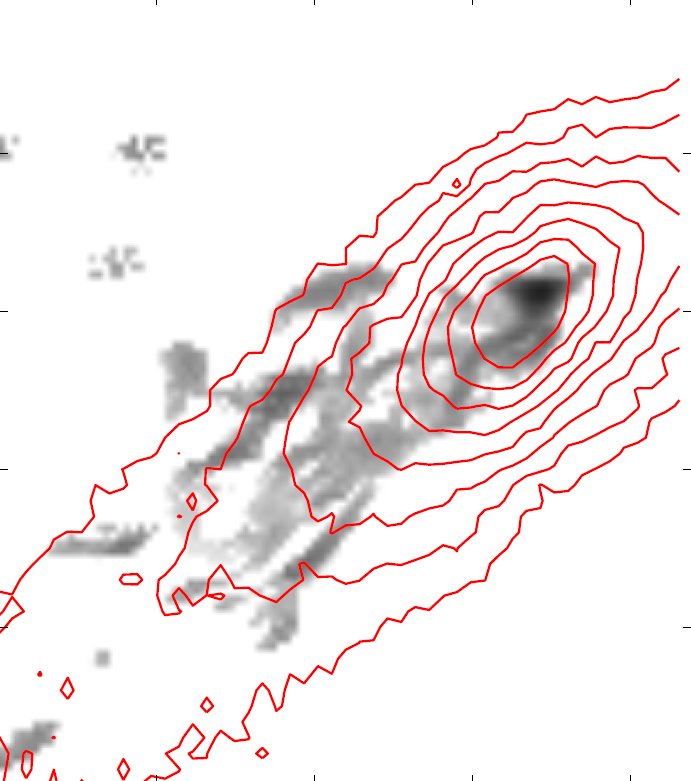 For example, how high does the gas density get when the cloud and disc collide - high enough for star formation ? Would the simulation have allowed star formation to happen, or was it turned off to save CPU hours ? Or does the complex hydrodynamics actually make the gas density decrease in some way ? The simulation reproduces the observed cloud, yes, but that's all we're shown. It would certainly be nice to watch how the cloud evolves. Make no mistake, I'm excited about this paper. But I also don't want to leave readers with a feeling that any minute now someone will reach an exciting or uninteresting but definitive conclusion - science isn't like that. It's a process - people have been observing the Smith Cloud for years, and it's very unlikely we'll get a decisive result anytime soon, if we ever get one at all. So, what would it take to prove a dark galaxy, definitively ? It would be difficult, but not impossible. The gas would have to show all the features of ordered, stable rotation we see in normal galaxies. It would have show no any signs of interacting with another object - otherwise there could always be some doubt that it was formed by the interaction, somehow. It would have to be extremely isolated, to avoid any suggestion that it formed by an interaction in the past. The Smith Cloud research is very exciting, but the platonic ideal of dark galaxies has yet to be found. Until then, the hunt goes on. What propels HVCs? I look out my window and see a sun dimmed by passing clouds on a hazy day. Some of the clouds are moving twice as fast as others clouds passing in front of the distant sun. Why do those clouds move faster? Are stellar events and day to day occurrences like weather on earth? Are we actually studying an explosion in a vacuum? Is all the matter clumps of dirt and dust that has enough vastness to eventually have gravity affect the clumps and pieces of dirt to the point where we get two sticks rubbing together to generate heat? What is all the chemistry have to do with it. Do we study macro to understand micro to understand atomic level events. Where is the correlation of earth to sky, from the universe to the quark, or is there one? Maybe there is an analogy, a super-theory out there that's right in front of our noses, but we cannot see b/c of the trees. Think on.